I went into Walmart yesterday to ask about the price accuracy guarantee. An hour later, I left in a rage. For a while, Walmart was backing up their "price accuracy policy" with a $3 rebate whenever their price at the register came up different than their price marked on the shelf. That guarantee and rebate is no longer being offered. It turns out that the $3 price accuracy guarantee was part of a legal settlement that Walmart agreed to in 2008. It was a four year agreement... which has now ended. If an item scans at a price higher than the shelf or advertised price, we'll correct the error. Hey, that's fine. They don't have to make a big deal out of simple errors. They probably don't penalize you for a simple error, like for writing a check that's returned from your bank. What got me riled up is the woman at the customer service counter. She was adamant that mis-priced items were the fault of customers, who routinely place unwanted items back on the shelf, initiating the problem. She decribed the scene: A customer carries an item around the store for a while, then finds another item he prefers. He drops the unwanted item onto a nearby shelf, near a shelf tag with another price. I was unimpressed. I've explored the wild landscape of Walmart already. Incorrect prices are common, and from what I had seen, the errors shouldn't be blamed on customers. I left the customer service area, determined to find an incorrect shelf price. I found one. This gift bag looked out of place on this peg at $4.67. The tag said "butterfly". 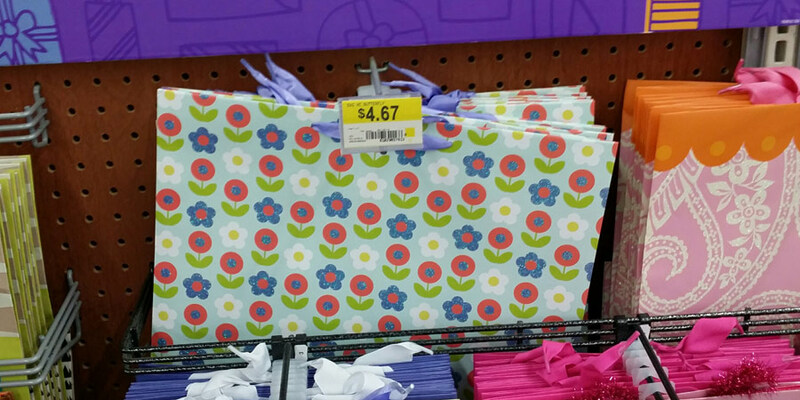 Sure enough, a nearby price scanner revealed these flowery bags were actually $3.36. And then I found another one. These tubes of Colgate Optic White were marked $3.97 on the shelf, but they were actually $3.96 at the price scanner. I headed back to customer service to express my concern. I wanted to show the gal at customer service that mispriced products shouldn't be blamed on the customer. Of course, that didn't happen. The original gal who had helped me called her manager over, and no one cared about incorrect prices unless I'd already bought the items. The one-cent difference was chalked up as a "rounding error", and the gift bag error was blamed on an independent vendor. I couldn't believe that having inaccurate prices on the shelf at Walmart raised no concern at all, but I guess that's how it goes after the terms of your lawsuit settlement run out. How Far Should you Drive to Save a Stamp?